"Comfortable to sit in, and the braces along the legs offer a natural footrest." "Solid, well-constructed, and made of real wood, in a warm finish that works well in many kitchens." "A longtime favorite in restaurants and cafes that has made its way into the home." "Offer a great combination of comfort and durability." "A more modern take on the swivel chair, with an ergonomically curved seat and shiny chrome base." "A counter-height stool that family and guests will be happy to hang out in for hours." "Comes in both counter height and bar height and in a range of soft neutral tones and elegant pastel colors." It’s hard to go wrong with a classic wooden saddle-seat bar stool. This basic, space-saving shape has been around for decades, and the backless seats can scoot almost all the way under the countertop to give you more wiggle room when not in use.. 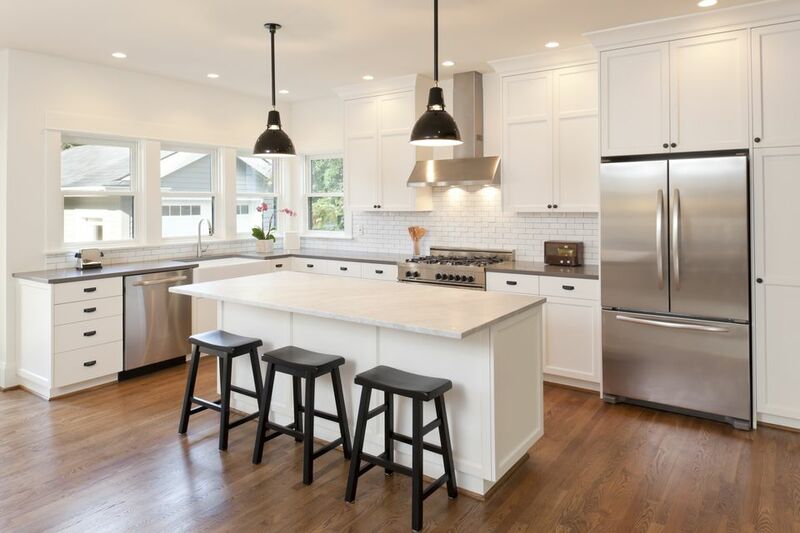 The seat is wide but on the shallow side, great for perching at the countertop, but not so large that it will crowd the pass-through space in a small or medium-sized kitchen. The carved seat is comfortable to sit in, and the braces along the legs offer a natural footrest. Made of solid beech wood with a walnut finish, this stool is done in a medium wood tone that works in both casual and formal spaces. These stools are available in both bar and counter height, so they’ll work for just about any kitchen or bar table. Try the Winsome Wood Saddle Stool in the counter-height size if you need a shorter option. A stylish bar stool for under $25? Totally possible! To find a budget-friendly bar stool, look for ones made of inexpensive materials, like wood or aluminum, with a no-frills construction so you’re not paying for bells and whistles like swivel mechanics, upholstery or extra design details. What you’ll find: Stools like these that are solid, well-constructed, and made of real wood, in a warm finish that works well in many kitchens. This classic round four-leg design works well in casual spaces, and can lend a friendly tone to formal kitchens, too. And unlike a lot of other budget-friendly furniture, these stools come fully assembled. Metal is a durable material that works with a variety of kitchen decors, from rustic to modern and even traditional. And because metal can come in so many finishes and colors, it can take easily take on different looks, even in the same basic shape. The square-topped metal stool is a longtime favorite in restaurants and cafes that has made its way into the home. In neutral colors like black, silver or white, it can seamlessly blend into a space without making too much of a style statement, a great option if you already have dramatic lighting or tile. But in a bright color, like orange or Kelly green, it can inject the room with a playful personality, just by changing up the seating. These metal stools are stackable and can be used both indoors and outdoors, making them a versatile option for many spaces. Whether you have a bar set up in your backyard or a higher table for dining, a weatherproof bar stool is a must to truly enjoy the space. Typically, outdoor bar stools are made of the same materials as other outdoor furnishings, such as wicker, metal, treated woods and plastic. Your outdoor bar stools don’t have to match your other outdoor furnishings exactly; in fact, it can be nice to contrast materials and textures in the entire space. These outdoor bar stools offer a great combination of comfort and durability. A high back and generous arms, combined with the woven seat and back, make them comfortable for lounging for lengths of time. They’re made of PE wicker over a coated iron frame to make them weather-resistant. And the wicker look is a classic for outdoor furnishings for its tropical feel. Swivel stools are great for entertaining or for placing in areas where you might transition between conversing with people in one spot and then another. Many people like having the option to move around as they sit, and if you’re concerned about scratching your floors (if you have hardwood, for example), swivel chairs can be a good option since people don’t need to scoot them away from the countertop to get right into their seats. Swivel bar stools are available in a range of styles, from a classic chrome diner-look stools to pub-style wooden ones. This streamlined set is a more modern take on the swivel, with an ergonomically curved seat and shiny chrome base. It’s available in three solid colors. And as a bonus, this swivel seat is also adjustable from counter height to bar height, making it easy for both children and adults in a range of heights to get comfortable at the countertop. Wood is a tried-and-true material for seating. It’s sturdy, can be carved or stained in myriad styles, and is pretty much impervious to spills if you address them quickly. Wooden stools also has more give than their metal counterparts, making them more comfortable for most people to sit in. Add to that a tall, generous seat back, like this Windsor-style seat, and you have a counter height stool that family and guests will be happy to hang out in for hours. This classically-shaped stool comes in black and white, plus three more peppy colors to work in a range of spaces. In a classic neutral, it can fit in with a formal or traditional space, but in a bright color like lemon yellow or mint, it’s a truly modern update for a fun dining space. While barstools tend to be considered a more casual seating option, a traditionally-styled upholstered bar stool can be just as formal as a true dining chair. In elegant kitchens, they can match the tone and in more casual ones they are one of the most comfortable options for seating. Plus, you can typically find more patterns and colors in fabric than you will in other materials. That fabric can be covered or replaced in a few years if you want to change the look or need to spruce up shabby, tired fabric. While fabric or leather seats will require more upkeep than wipe-clean plastic or metal ones, a material pre-treated with stain resistance usually cleans up quickly. This tufted upholstered bar stool comes in both counter height and bar height and in a range of soft neutral tones and elegant pastel colors, as well. Millennial pink, anyone? If you need a shorter bar stool, try the Threshold Brookline Tufted Barstool in the 25-inch height.